On a recent trip to Germany, we stumbled on a outdoor produce market in downtown Mannheim. I have always been interested in how people in different cultures raise, sell, cook and eat their food. I thought, “This is great because this is where the locals shop.” We wandered around, unable to communicate with anyone with the language barrier. I was amazed at the presentation and cleanliness of the way they marketed their produce. It wasn’t a dusty, dirty kind of open-air market! I spotted something I had never seen before. 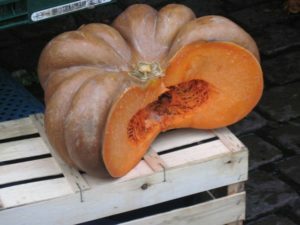 It was a variety of pumpkin called Musquee De Provence. A little research when we got home revealed that in the US this variety is sometimes called Fairytale Pumpkin. A deep ribbed and sort of flat pumpkin with a dull red outside caught my eye. But it was the inside that blew me away. A thick, deep-red flesh inside tempted you to just pick it up and eat it like an apple. They cut it in quarters and sell it that way. It’s a Southern France mainstay and great for cooking. They average 8-15lbs. and store well. Seeds are available from www.rareseeds.com and www.johnnyseeds.com. I have ordered mine and they will have a home in the Hoss Garden this year.